The Royal Bermuda Regiment is offering the opportunity for musicians to join its ranks on a special limited engagement package for one year of initial service, with an upcoming information session aimed at spreading word of the opportunity. The engagement will be paid, running from February 1 to December 17, and will not require volunteers to complete military training or liabilities beyond that required for a military marching band. The information session will take place on Wednesday, January 27 and auditions will take place on Saturday, January 30, with both events taking placing at Bank HQ in Warwick Camp; both events are non-committal. 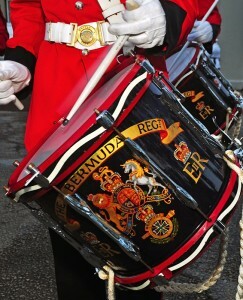 A spokesperson said, “Musicians are invited to join the Royal Bermuda Regiment on a special limited engagement in order to support the Band and Corps of Drums for 2016. These musicians will augment the Band’s numbers on parade and allow musicians to experience life in the Regiment with a limited service commitment. “Under the parameters of this instruction, Limited Engagement Musicians [LE Musns] will be enlisted into the Royal Bermuda Regiment through the normal administrative process, completing enlistment in line with established practices, including physical and medical assessments. “The duration of the engagement will be from February 1 until December 17, with no further commitment beyond that point. Interested persons may, however, continue their service; however, they will be required to re-engage with the Royal Bermuda Regiment as a regular part-time soldier. “LE Musns will be engaged as Private Soldiers [Basic] and will be remunerated as per the current Military Pay Scale Step One: Drill Rate: $35.74 [a unit of time of approximately 2.5 hours] and Daily Rate: $142.92 [equivalent of four  drills]. “Musns engaged under the scope of this instruction will be required to govern themselves by the regulations within the Defence Act 1965 and by ordinary military norms, customs, and practices [i.e. paying compliments in uniform and being subject to military law on duty]. Individuals will be introduced to these regulations and customs as part of their orientation to the Regiment. “The audition will include one prescribed performance piece as provided by the Band Office; one prepared piece, of the candidates choosing, which demonstrates the musician’s ability; a brief marching and playing assessment; and a minimal medical and basic fitness assessment. “Throughout 2016, a number of performances/engagements will demand the time of LE Musns and, among other parades, they should be prepared to participate in the Peppercorn Ceremony, Annual Overseas Training Exercise, Queen’s Birthday Parade, the Convening of the Legislature, and the Remembrance Day Parade. “Additionally, Band rehearsals are held most Monday evenings from 1900hrs. A monthly schedule will be prepared and all musicians will be required to attend regularly through the year. For more information about this opportunity, call 238-2470 or email bermudaregimentband@gov.bm. how much does government spend on this annually? is it necessary really?